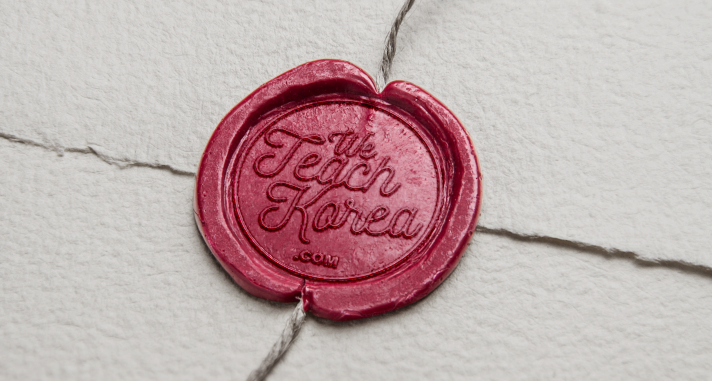 Since my time in Korea is winding down (more on that later) I decided to start working on my Korean bucket list, you know the things that one "must do" while in Korea. 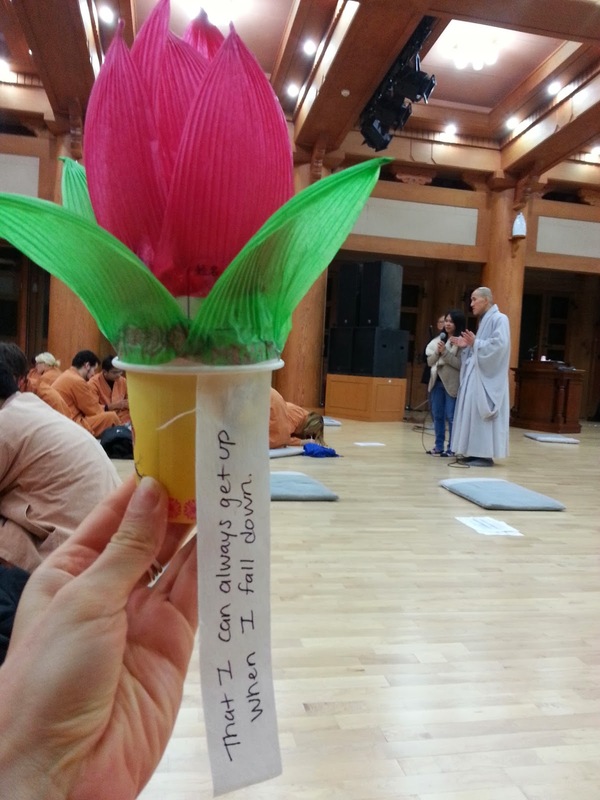 I've been talking about doing a temple stay since I first arrived in Korea, but for some reason kept putting it off. About a month ago my vice principal walked over to my desk and handed me a packet of papers saying "umm if you're interested you can do" and then disappeared (he's sneaky like that). I'm not sure if he can read minds (or maybe he spies on me?) because I had literally been searching for a temple stay that morning, and what he handed me was an application for a free temple stay at Jikj temple in Gimcheon. I've been to this temple once before, with my dad and really enjoyed the scenery and beauty of the mountain setting. The temple stay program is one of the most popular in this area so seeing as I hadn't yet made plans for that weekend I decided to apply, after all it was free so I had nothing to lose. I told a few friends about the temple stay but none of them seemed very eager to join me so I wound up applying alone. Obviously this is no problem for me, after having traveled alone to countless countries one weekend would be a walk in the park. Actually, I was kind of looking forward to a weekend of peace and quiet, except that's not exactly what I got. A few days before the temple stay I found out my friend Sam would also be going on the trip, fair enough, one friend (that I haven't seen in a long time) would be a good addition to the weekend. 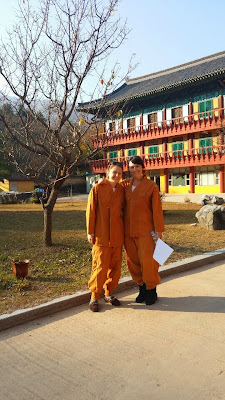 We met at the train station Saturday so we could head to the temple together but upon arriving in Gimcheon I realized why this would not be the traditional temple experience. We were soon on board a bus of countless foreigners, all of whom were headed to the same place we were; I guess I kind of overlooked the whole "free for foreigners" aspect of the trip. Upon arriving we were given our temple robes, changed and had some free time to wander around and explore the area before our program began (ie. wait for all of the latecomers). 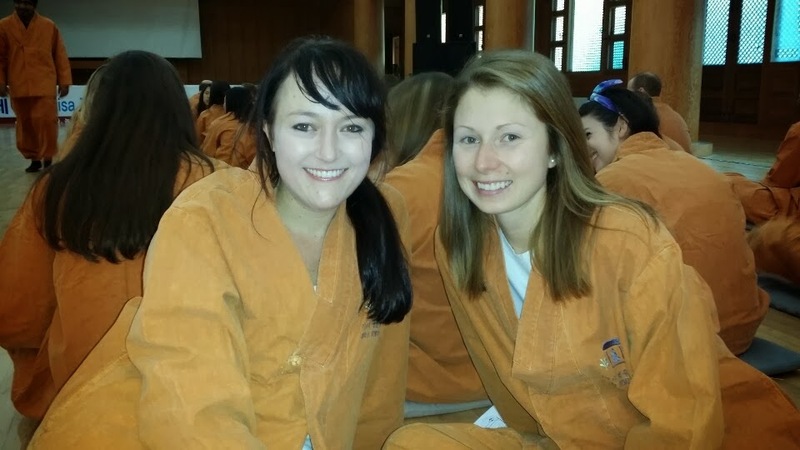 There were close to 200 foreigners signed up for the program (foreign teachers like myself, exchange students and a few PhD scholars) but only about 120 of them showed up. I'm sorry but if you apply and are accepted to a free program it's extremely rude to just not show up, at least have the courtesy to email or call and cancel. 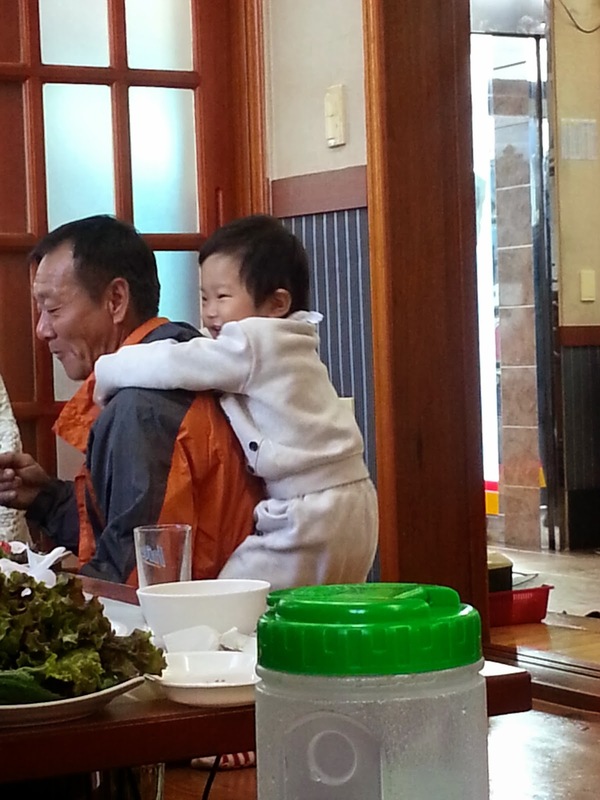 We had a nice welcoming from Beopsan (the temple stay manager) and a brief video explaining the details of our stay. 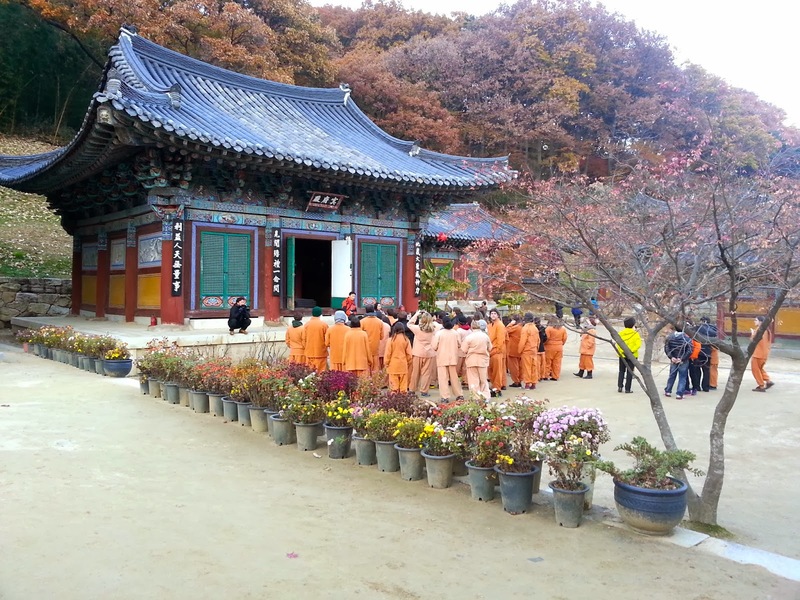 After that it was time for a temple tour so we broke into smaller groups each of which were led by a volunteer from the Gimcheon culture center. 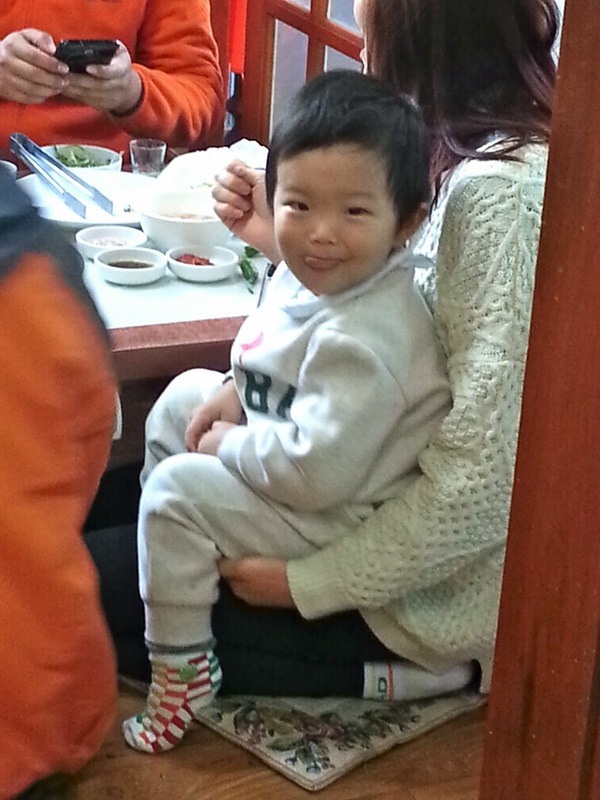 We had the cutest little ajumma leading our group but unfortunately our translator was a bit of a let down. I think she was Filipino but her translation skills left a lot to the imagination, literally I could understand as much as she translated (in the Korean version) so she ultimately just gave up. Thankfully I had already experience a full tour of the temple so I didn't feel like I was missing out, but I did feel bad for our tour guide who clearly had a lot she wanted to tell us. It's times like these that make me a bit frustrated with myself for not doing a better job of learning the language. 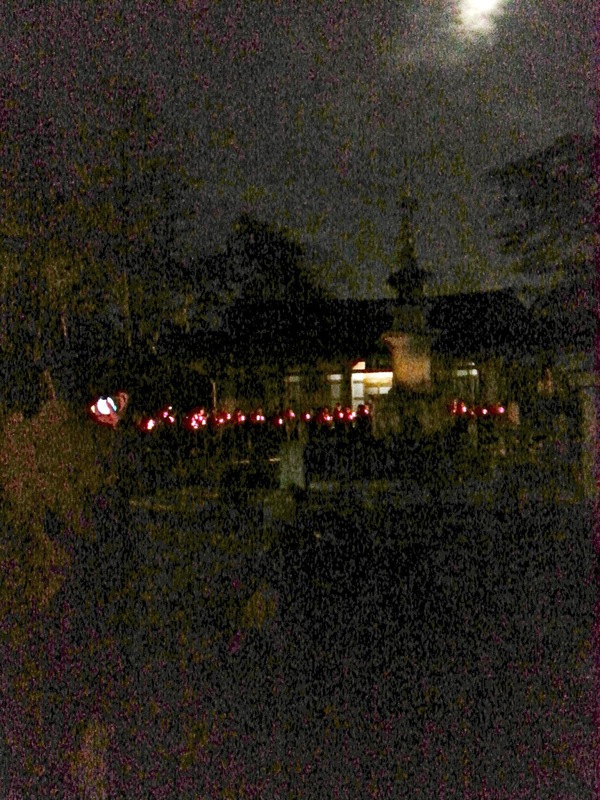 Once everyone finished their lantern masterpieces it was time to go for a walk around the pagodas with our lanterns. I'm not sure they explained the reasoning behind this or not (well the monk probably did but our translators version was "just follow him") so we did as we were told. From what I gathered it's a traditional practice, walking around the pagoda in a clockwise fashion, keeping silence, and 'making your wish', here's to hoping mine comes true. Although our original schedule had us busy until 9pm we were back and organized into our 'bedrooms' by about 7:30, with the rest of the night to ourselves. 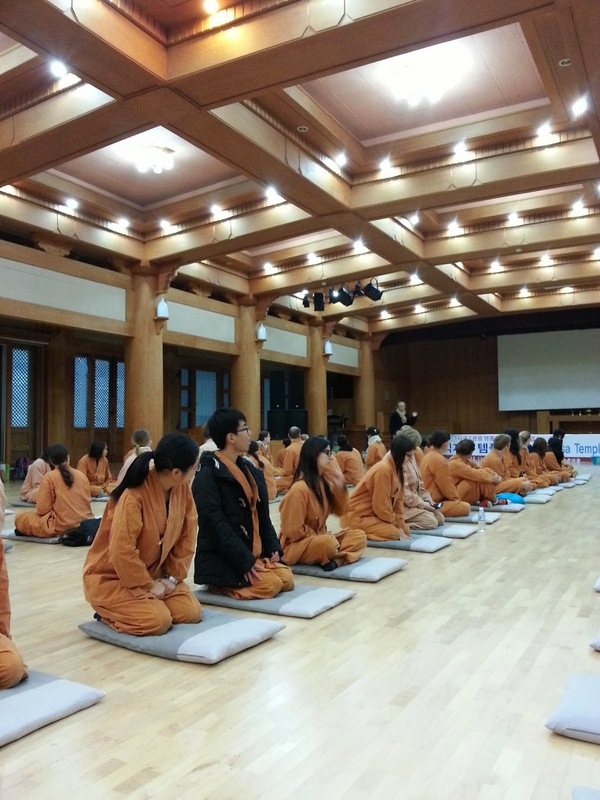 I think this was the major difference between the traditional stay and ours, given that there were so many of us they cut out the 'conversations with monks' and time spent for meditation/relaxation. 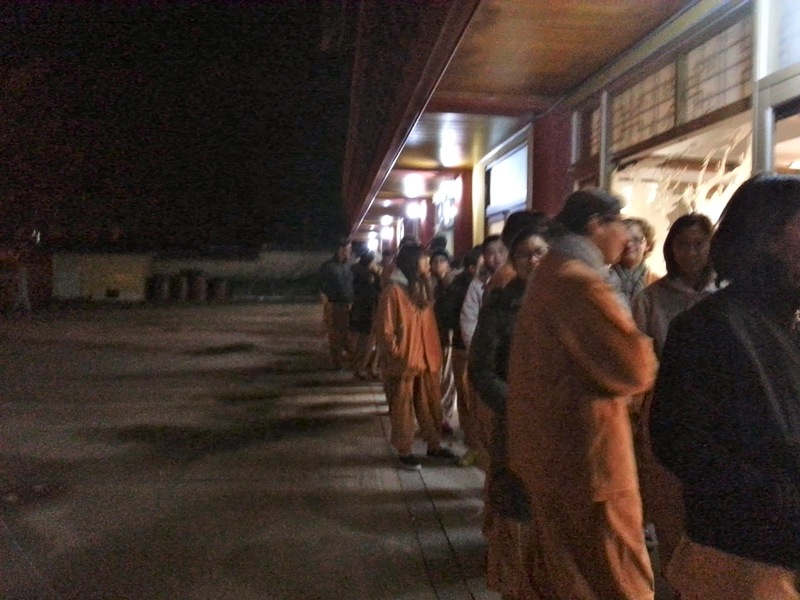 Also, the temple managers will usually collect phones and electronics before the program begins requesting silence throughout, but neither of these practices were completed with us. Our rooms held about 20 people, each with a nice square of floor to sleep on and lights out was set for 10 o'clock. I spent some time talking with Sam and her two friends from Daegu before getting ready for bed and thankfully falling asleep around 10, I guess others didnt' have as much luck due to some excessive snoring and discomfort found on the floor. The next morning our wake-up call came at 5am, two hours after the monks rose for morning prayer, and we were guided into the dinning hall for breakfast starting at 6. 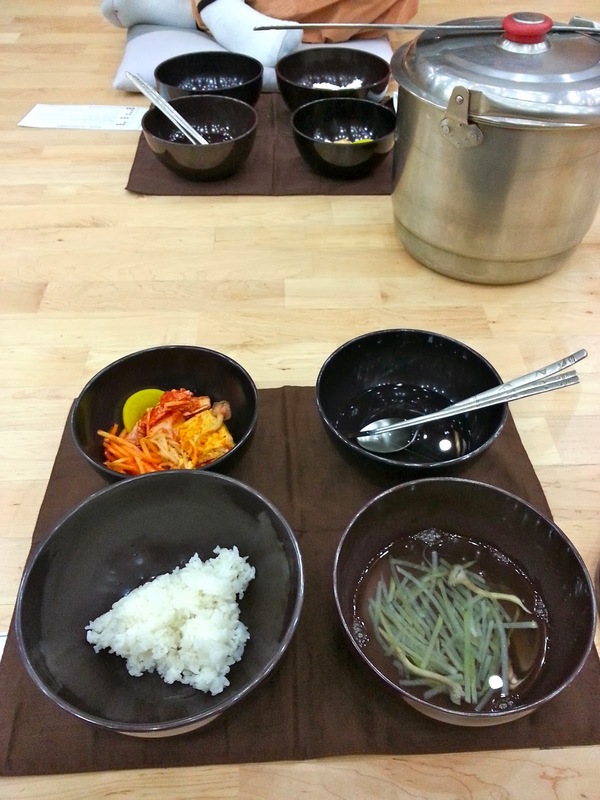 I'm usually a big breakfast fan but eating before the sun is not my cup of tea, especially when the menu consists of rice, kimchi, tofu and various vegetable dishes; I must admit though, it was pretty good. After breakfast we went back to our rooms where some of us (myself included) caught a quick nap before gathering for our morning program. Again they cut the program a bit short because traditional temple stays have the participates take part in temple chores including things like sweeping around the temple, but we did none of that. They played us another brief video about temple life before it was time for our 108 bows and bead making. Honestly this was probably the coolest (and most traditional) part of the whole experience; we were lined up in four rows facing each other and given materials to make our beads. 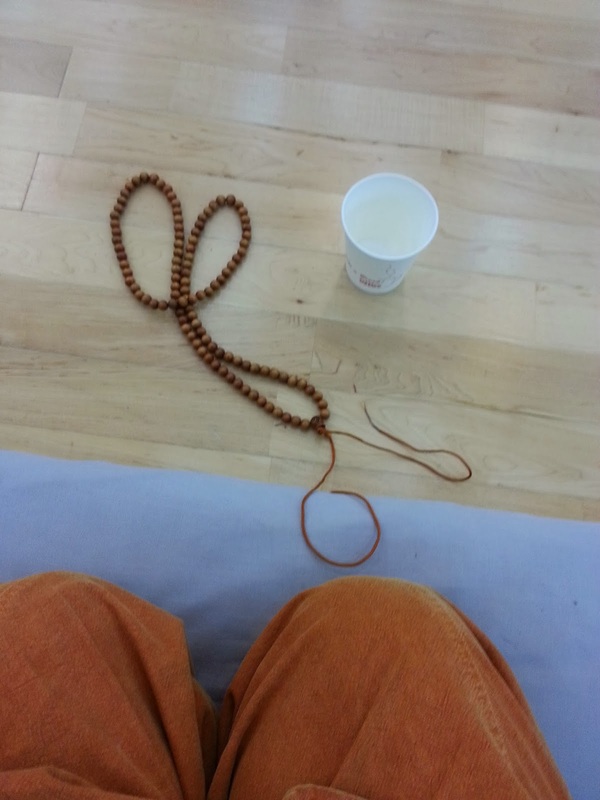 We were given instructions (and practiced) how to complete a full prostration ( Ashtanga-Namaskara ) in which there should be five points on the floor (both elbows, knees and forehead). We quickly became masters of the full bow and thus the ceremony of 108 began. In the middle of each bow we were instructed to thread a bead onto our string and along with it make a 'wish' or 'prayer'. 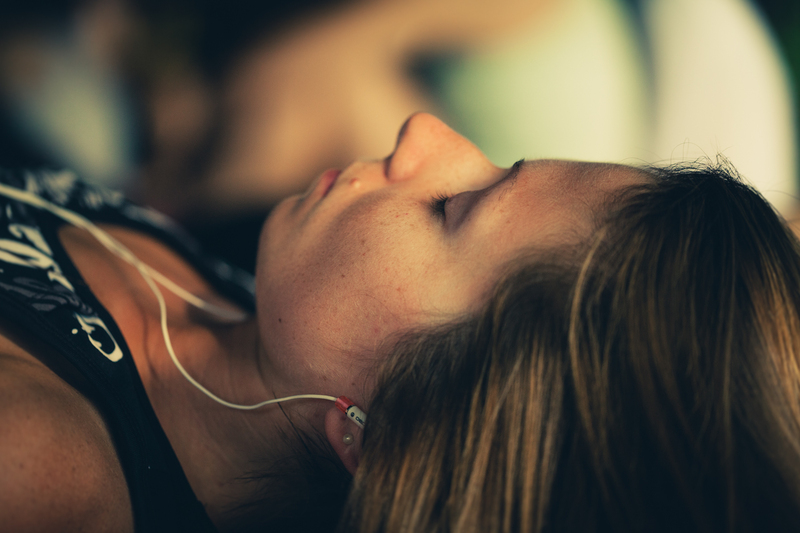 108 sounds like a lot, and it is (my quads thought so too the next day), but when your concentration is on thinking about what matters in your life, your loved ones - friends and family, those 108 bows go pretty fast. I admit I have a pretty great life right now, so when asked to make wishes my thoughts didn't go to myself, there isn't much I have to ask for right now. However, there are many people in my life right now going through major changes, hardships or new beginnings so my wishes and prayers went their way, I can only hope they were heard. Once we completed our bows and beads it was time to bring our experience to a close. We were asked to complete a brief survey of our overall temple experience, changed back into our regular clothes and sent on our way. Again, the program was much shorter than I was expecting but I guess to make up for this Gimcheon culture center had a few more activities in store for us. We loaded ourselves onto four coach buses and drove roughly an hour into the mountains of Gimcheon, eventually finding ourselves at a few small BBQ restaurants which was a more than welcome sight. After our early morning meal my stomach was more than ready for lunch; it was clear that everyone else around me felt the same way as they stuffed themselves with meat. After lunch it was back to the buses and on the road again, destination unknown. By this time I was more than ready to be separated from the 100+ other foreigners I was surrounded by, but unfortunately that was not an option. Instead my sunglasses and headphones become my savior, Sam told me I looked hungover but I explained that no, this is just my anti-social, "Don't talk to me" look. We soon stopped in the middle of no where but upon looking out the window I saw that there was a cabbage patch on the side of the road, i'm not joking. In order to make up for the lack of tradition we had with our temple stay, the culture center threw it all at us the next afternoon. 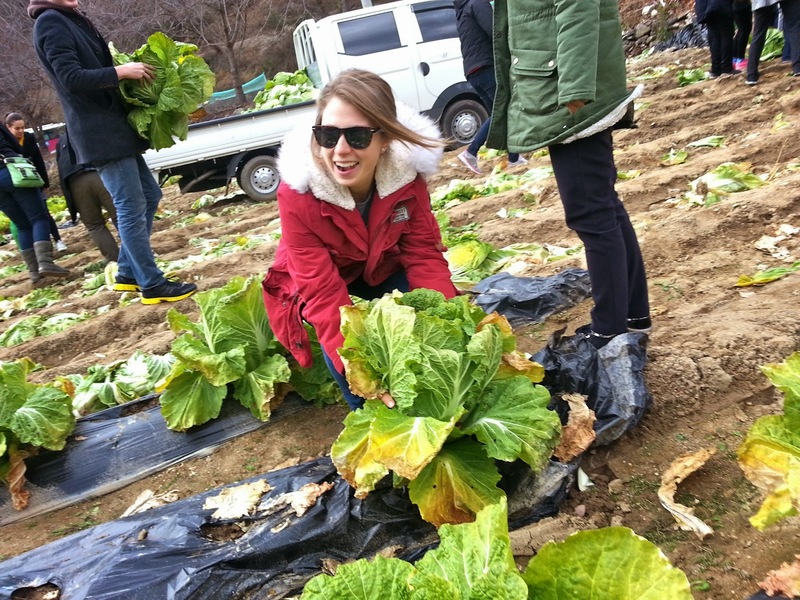 We were sent into the field to pick a cabbage, had it cleaned up and bagged, and were soon back on the buses and on our way. 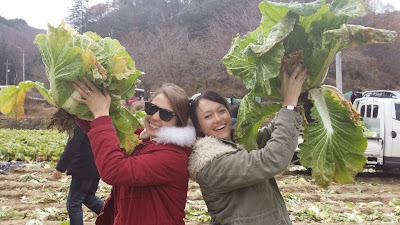 We all assumed that we would be using these cabbages to make ourselves Kimchi but then we got to our next location and were told to leave our bagged cabbages on the bus, leaving us all a bit confused. 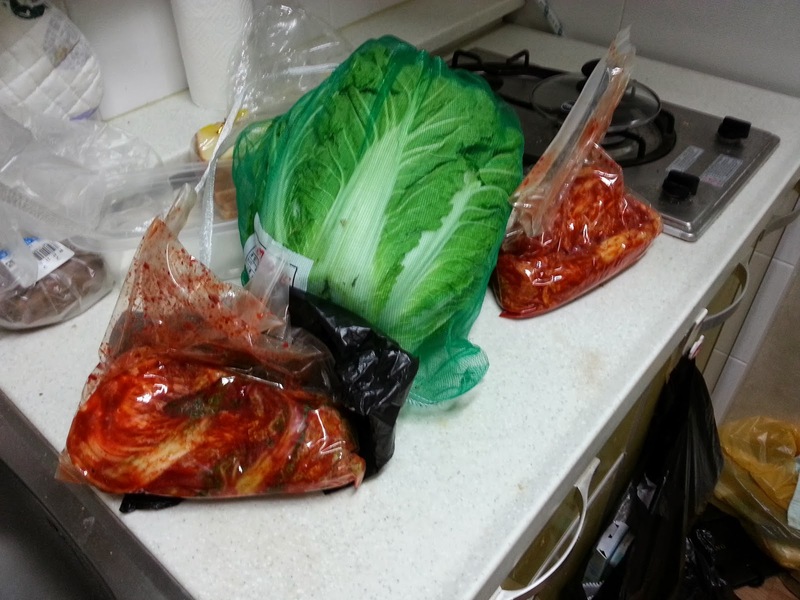 It turns out that in order to make Kimchi you first have to let your cabbage soak in a bath of saltwater for at least 12 hours so those massive cabbages we just picked would not do, no those were ours to take home. Instead they had another batch of pre-soaked cabbage ready and waiting for us, again thumbs up on the organization skills at work here. 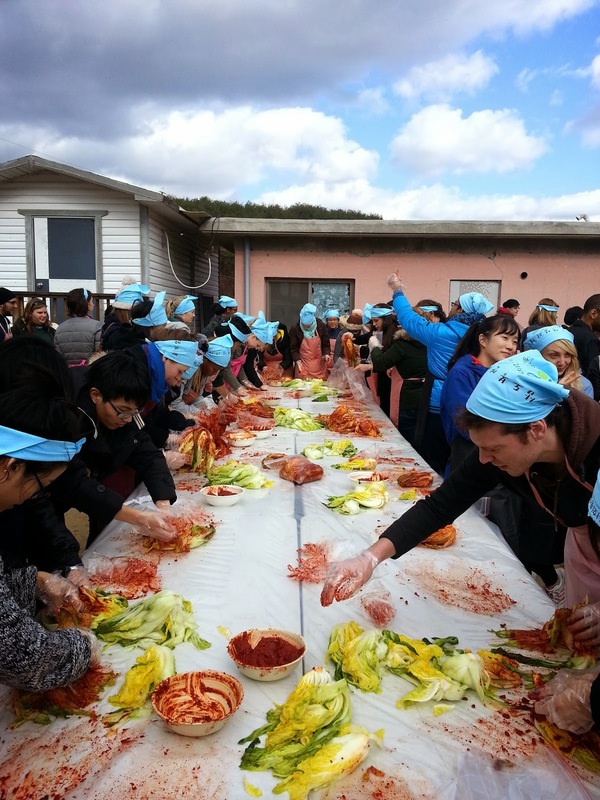 Bandanas, aprons and plastic gloves were quickly distributed and we were soon at work massaging gochujang (red pepper paste) into our soaked cabbages. Clearly they gave us the 'easy version' of the task at hand, i'm pretty sure the traditional method includes a few more steps. Once all 120 of us had our turn at making Kimchi (playing with some cabbage) we were loaded back onto the buses and finally ready to head home. Despite the fact that it was only 1:00 we were all tired and ready to be back in the familiarity of our own towns. Sam and I got extremely lucky with the timing, arriving at the train station around 2:05 giving us just enough time to stop in the bathroom and buy tickets before catching the 2:14 train. My luck then continued in Gumi where I just barely caught the 115 bus which would take me home. When I say just barely i'm not exaggerating, I actually ran alongside the bus for a few blocks as it inched it's way through traffic so I could beat it to the bus stop. Clearly I've given up caring what people think of me, i'm sure I was getting plenty of stares as I ran down the main street of Gumi carrying a big bag of Kimchi AND a full head of cabbage. My haul, guess i'll be eating cabbage for a while...? Although the weekend was a bit different than I was expecting, and definitely not your traditional temple stay experience, i'm still glad I took part in it. I thought going into it that if it wasn't everything I expected I could still take part in another temple stay (likely the one near Gyeongju) as I had originally planed, although now i'm not so sure. I get the feeling that all temple stays in Korea have turned into more of a tourist attraction rather than a cultural experience so having to pay (roughly) $50- i'm not sure if it's worth it or not. More than likely if i'm to experience something like this again it'll be during my travels through SE Asia. It would be interesting to be able to compare and contrast experiences with temples/monks/Buddhism throughout different countries, I will of course have to keep in mind that this was not your everyday temple stay experience. Next time please leave the other foreigners at home.